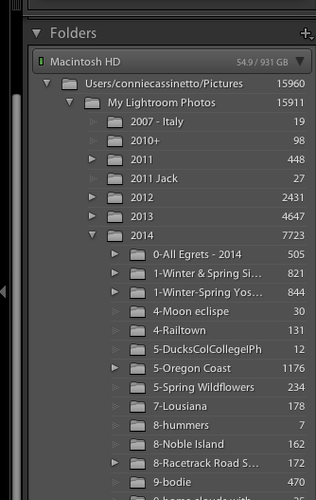 My system is one main folder and sub-folders for each shoot. ﻿Lightroom is a wonderful tool to help you enhance and bring your photographs to life, whether you shoot in jpeg or raw, use a PC or a Mac. It also assists you in organizing your photographs and allows you to mark them so that you can find them in many different, fairly easy ways. Almost any photo can benefit from a little tweak here and a little tweak there to highlight some part of it, to lighten a shadow or darken a sky, and Lightroom can do this and so much more. While many LR users are old hands at it, many photographers are new to the software program and, as stated right upfront, this site is geared toward new photographers who are just now learning LR. I do not plan to tell you everything there is to know about LR and/or photography as I am not qualified to do that. And, you can find a plethora of information on other web sites. But I do plan to share a little bit of what I know and it might make getting started somewhat easier. I was at a workshop a few weeks ago and someone in a group was talking about "losing" photos in LR and I don't think this is uncommon with new users. I also know that some of the people I've worked with have gotten their photo organization into a real mess, having to start everything all over again as that was easier than trying to sort it all out. I want to help you avoid these and other beginning mistakes. The very first thing you need to do prior to ever opening the LR software is to know where your photographs reside on your hard drive and how they are organized. Your photos are not organized in LR, they are organized on your hard drive in whatever manner you organized them into, assuming you did that at all. When you import photos into LR, you simply create a link between the photo itself and the record of the photo in the LR catalog. LR does not "contain" any of your photographs, it simply links photographs from LR to the folders on your computer's hard drive and that is where the folders stay unless you choose to move them. This is why you need to know where they are and how the folders are ordered. You will not be working directly with the folders on the hard drive, but it helps you to visualize the order of the folders if you see them on your hard drive and it can help you figure out where you instructed LR to put your folder when you do make a mistake. Once the folders are linked to LR using the import button you will see on the left hand side panel in the Library module the same hierarchy that you saw on your hard drive. How these folders are organized is up to you. Some people use dates and other people use shoot site names and/or years, or some other organization. It really depends on how your brain orders things, but you must be ordered or confusion will ensue. At the time you link the folders of photos to LR using the import button you will instruct the software as to how you want the photos put into your photo hierarchy. This concept seems to be one of the most difficult ones for new users to grasp, as even the help module of LR addresses it: "Important: When importing for the first time, think through how you want to organize your photos and where you plan to store them before you start to import. Planning ahead can help minimize the need to move photos later and possibly lose track of them in your catalog." Note: the bold type (before) is straight from the Apple help manual! I use the year shot and then sub-folders contained within each main folder: the sub-folders are named by shoot site. In order to keep the folders in an order similar to the month they were taken I begin the title with a numeral from 1 to 12. So, in the 2014 main folder I have sub folders that say, "10-bodie," or "9-bodie." This works well for me but might not work well for you; it's a personal decision. But you do need to decide how you are going to organize your photos and then keep to that mode of folder hierarchy in order to avoid confusion. Once you learn the program it gets easier to change structure without creating chaos. All day-to-day changes to the folder hierarchy are done from within LR, never change the folder structure from your hard drive as this will only confuse you and create instant and lasting chaos. So, spend time figuring out your folder hierarchy prior to starting in LR and you will save yourself hours of chaos. Remember, too, that there may not be a need for you to link all of your photos to LR at once: I have folders of photos on my hard drive that are not linked to LR but can be instantly linked if I need to do that. Your photos, at first, should all be linked in one catalog and you will work with folders and collections as you desire within that catalog. What is the difference between a catalog and a collection? A catalog is where you store all your linked photos, usually in file folders. A catalog is what opens up when you open the program. A catalog is normally permanent and allows you to process and work with your photos. You can have multiple catalogs and can only work in one catalog at a time. A collection is a tool within the catalog that allows you to pick certain photographs to use for special purposes. You use collections as a means of identifying a group of photos that you want to use for a slide show, a book, to export, or to show someone. Collections can be permanent if you choose that option but can be created and deleted at will. Deleting a collection does not delete the photos from your catalog. Creating a collection does not create a duplicate photo. The photo you see in the collection is a simply a screen copy, so to speak, of the original photo. For Mac users who have been using iPhoto, finding your photo files can be difficult as iPhoto has its own, unique way of placing files on your hard drive. This may apply to Aperture as well, although I am not certain of that but assume it may be the case since it, too, is an Apple product. The other thing you need to decide is do you really need to move files from either of those programs to another place on your computer's hard drive to use in LR. You cannot move a photo in an iPhoto library directly to LR. You can, however, simply export that photo (or photos) to a file on your computer's hard drive and then import them into LR from there. It can be time consuming to move all of your files from one program to another so give it some thought before doing it. If you are currently working in iPhoto and do decide to move all of the photos one of the easiest and least confusing ways is to export to folders on your hard drive and then import into LR as desired. I'm sure there are other ways as well but I try to do things in the least confusing ways possible. If you want to actually locate the iPhoto library on your hard drive you can do an on line search for information on how to do that. The LR help manual says this: "In the finder, navigate to your iPhoto package file. By default, it's located in /users/[your user name]/Pictures, and it's called iPhoto Library." There are additional instructions, go to the LR Help menu: LR Help>Import photos from iPhoto (Mac OS). You might also be interested in knowing that both iPhoto and Aperture are no longer being supported by Apple and Apple came out with a new program in 2015.